Freight Broker - Part Time or Full Time - Is It For You? Who can become a freight broker? The opportunity is available for any adult who is looking to make an unlimited income that is dependent on your personal efforts. To make the big upper six figure incomes, anticipate having employees (freight agents) working under you in an office or telecommuting enviroment. Truckers tired of life on the road, women wanting a part time home job and others looking for a new career have been successful in the freight brokerage business. In fact, there are more freight brokers or freight agents working part time from their home matching a shipper’s loads with truckers needing a load to haul than there are full time freight brokers or agents in the business. In a nutshell, your job will be to find shippers needing freight moved, usually at a set price per mile, then finding truckers(carriers) willing to move the freight for a lower set price per mile. The difference between the two prices is your profit for bringing the trucker (carrier) and shipper together. 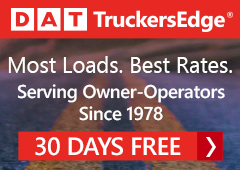 Many successful brokers use services such as DAT’s Express Load Board to find more business by utilizing their on-line freight matching data bases. "Can people actually make money as a freight broker?" Yes, some brokers do very well and some brokers never get out of the gate due to poor planning, inadequate training and lack of commitment to push hard for success. One broker we know drives a new vehicle and is always taking trips to places like Vegas, Reno and the Bahamas. He has built up his customer base and now takes his office with him on the road. By transferring his office phone to his cell phone and using apps to conduct business, his office can be wherever he chooses. The key point here is: "He Had to Build a Customer Base!" With nearly a million shippers in the United States and with many of them outsourcing their shipping needs to save money, a person who is willing to make contacts and build relationships with shippers, transportation carriers and big rig owner operators can make a good living. Pay day only comes when you Make The Deal Happen! "Sounds easy enough to become a freight broker and make good money, right?" Well, as with all things that sound easy; you can fail before you get started without proper research and training. Freight brokering can be very stressful and one mistake can cost you big bucks, a major client or even worse, your business. Do You Need to Have Formal Training to Be a Freight Broker? You are not required to have certified training to obtain a broker’s authority to start your business. Big Rig Central.com recommends you obtain formal training from either a “Hands On” freight broker training school, from an on-line training site or a home training course designed for you to become a freight broker. Some people need the “hands on” training while other people have no problem gaining the knowledge through on-line training or a home course. Some training providers offer a combination of on-line and telephone training along with the option to pick the training modules that fit your training requirements. They also offer provide on going support after you finish the class which can be very important as you progress in your business. How you get the training is your decision to make. Again, we do highly recommend formal training of some kind to increase your odds for success in the freight broker business. Do your homework to make sure a freight brokerage business is the right path for your financial success. Find a book at your local library or buy a book on line to learn more about the business before you invest hundreds if not thousands of dollars in formal training. With that said and with you understanding our recommendations to pursue formal training of some kind to increase your chances for success; let’s find out what it takes to become a freight broker. What Do You Need To Get Started To Become a Freight Broker? In addition to any local and state business license requirements, you'll need to obtain a brokers authority, $10,000 surety bond and a BOC-3 filed to be in business. If you have a fax machine, 2 dedicated phone lines, a high speed internet connection and a good freight brokers software package, you are ready to get started. What's missing? Build personal contacts and build relationships with shippers mainly by telephone and at times by hitting the pavement to knock on doors. Yes, working from home doesn’t mean you get to stay home all of the time especially at first when you have to build your client base to make your telephone ring or your email account fill up with requests to move freight. You can utilize the internet to locate freight from shippers but do anticipate the shippers wanting references before they entrust you with their freight. The road to become a freight broker is not the easiest to take but you can make good money with hard work and a knack for building relationships with the shippers, transportation companies and truckers. Keep in mind one person can only be in so many places at a time or do so many things in a given day. If you want to make the upper six figure income, you may have to make the decision to recruit freight broker agents as subcontractors willing to work under your authority in a central office or via the internet to expand your freight broker business and your income. You will typically split the commissions generated by the freight agents working under your authority. Some freight broker agents become employees with benefits and a set salary in lieu of commission. Some people decide to be freight broker agents instead of a freight broker. Freight broker agents don’t have to obtain the authority, surety bonds or BOC-3 because they work under the authority of the freight broker. They will work in the freight broker’s office or they’ll work from home. The freight broker agent will still work the phones extensively, hit the pavement at times and search the internet to build contacts and relationships to find freight because pay day only comes when the freight agent Make The Deal happen! You have to decide with option fits the lifestyle that you are seeking. Do your homework by getting a book at your local library or buy a book on line to make sure the freight brokerage business is "right" for you before possibly spending hundreds or thousands of dollars on training. Complete formal training via classroom training, online courses or a home study course. If you pay for classroom or on line freight broker agent training, do verify the training provider offers placement assistance with a freight broker. Your phone or email has to be active with freight shipping requests preferably from the same shippers everytime to be successful in this lucrative business. Big Rig Central.com wishes you much success in your efforts to become a freight broker or freight agent.